DNA is under continuous genotoxic stresses from variety of environmental factors and cells have mechanisms to repair damaged DNA. The DNA repair machinery can be visualized as the granules in the nucleus by labeling proteins contained in the protein complex formed around the damaged part of DNA. Quantitative analysis of these granules is essential in the research fields such as anticancer agent, influence of radiation, monitoring the genotoxicity of environmental chemicals including tobacco ingredients, and the basic research of cell cycle and DNA repair mechanisms as well. This application note offers an example of the analysis of granules in the nucleus with CQ1. We performed fluorescent immunocytochemical staining for γH2AX then confocal images were acquired and analyzed with CQ1. 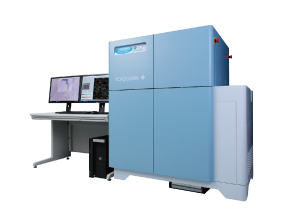 Confocal optical system is ideal for the quantitative analysis of intracellular granules because it eliminates fluorescence from out-of-focus plane. 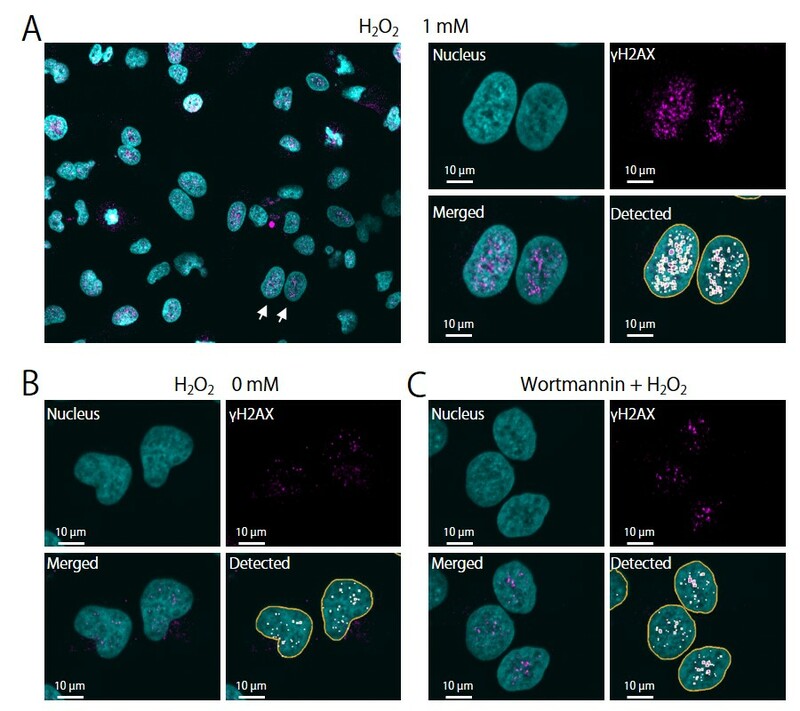 In this experiment, we examined the production of phosphorylated histone H2AX (γH2AX) induced by hydrogen peroxide (H2O2) and the effect of wortmanin, an inhibitor of DNA repair. Figure 1. Detection of the granules of γH2AX with CQ1. (A) Cells treated with H2O2. Right pictures show the higher magnification view of the cells marked by the arrows in the lower magnification view in the left. Nuclei and γH2AX granules are labeled with Hoechst33342 and Alexa Fluor 488, respectively. (B) Cells without H2O2 treatment. (C) Cells exposed to H2O2 after wortmannin treatment. 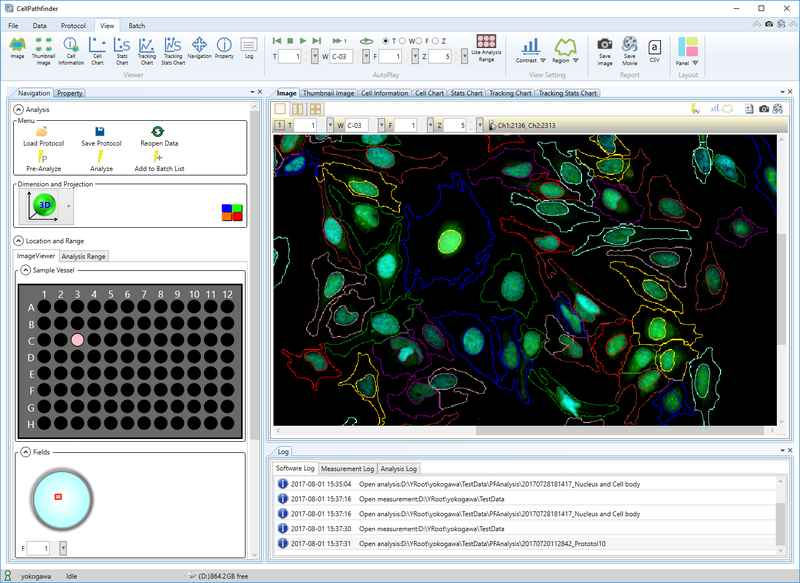 Confocal images were analyzed with the dot analysis template in the CQ1 software. Mean number of granules in a cell, size of the granules and the total intensity of the granules were quantified for each well (n = 5 wells for each experimental condition). Bars indicate s.e.m. HeLa cells were seeded (10,000 cells/well) in a 96-well plate (Greiner#655896) and incubated for a day. 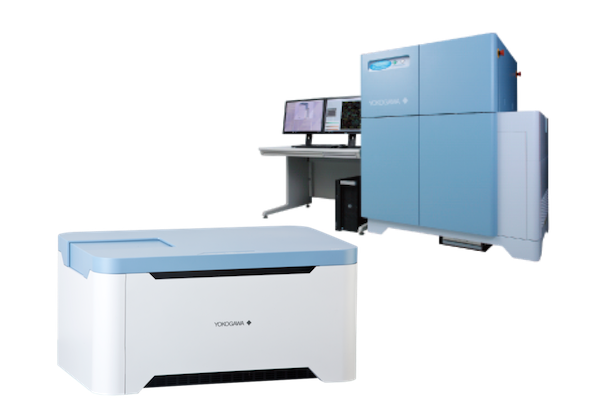 Wortmannin was applied in the wells (0 – 25 µM final concentration , 10 min, room temperature). H2O2 was applied in the wells (1 mM final concentration, 45 min, 37℃). Cells were fixed with formaldehyde. Nuclei were stained with Hoechst33342 and γH2AX was labeled with rabbit anti-γH2AX antibody (Enzo, No. ADI-905-771-100) and Alexa Fluor 488-labeled 2nd antibody . 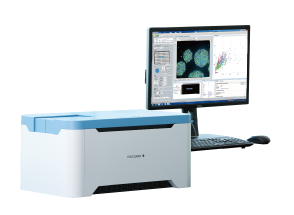 Confocal images were acquired with CQ1 (40x objective lens, 25 fields per well) and analyzed with the CQ1 software. In this experiment, we confirmed that H2O2 induces an increase in the number, size and amount of fluorescence of the γH2AX granules. In addition, the present results also confirmed the dose-dependent inhibitory effect of wortmaninn on the formation of γH2AX granules. It has been known that variety of proteins are recruited to form the DNA repair complex and a large number of H2AXs are phosphorylated in chain around the damaged part of DNA. The present results are consistent with the known mechanism of the production of γH2AX granule. The present experiment shows that CQ1 is an excellent tool for the quantitative analysis of intracellular granules. Histone H2AX is contained in the histone protein cores of DNA winds in nucleosomes. γH2AX is the phosphorylated form of H2AX and involved in DNA repair.